School boundary changes effective with the 2015-16 school year have been approved by the Governing Board. Find your child’s school under the new boundaries using School Site Locator and your residential address below. 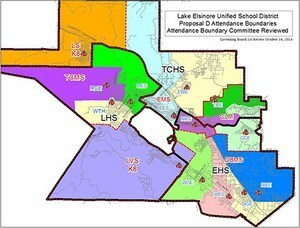 To maximize instructional opportunities for all students, new school attendance boundaries are being proposed in 2015-2016. This follows an intensive year-long review by an ad hoc stakeholders group known as the Attendance Boundary Committee (ABC). The ABC committee has considered population growth, balancing existing capacity with demand, and investing in classroom technology in its recommendations to realign some, but not all, elementary, K8, and middle school attendance boundaries. See sidebar FAQs below for questions and answers about the proposed boundary changes, impacts, timelines, and informational resources. This online map of school boundaries for 2015-16 allows users to input a residential address to find the schools that serve them. TIP: The default display shows Elementary School boundaries (color coded areas), but clicking the "layers" button at top right of the boundary locator enables display of Middle School and High School boundary lines. NOTE: The school attendance boundaries on this interactive map are effective with the 2015-16 school year. A grade span change to K-6 affects only Ronald Reagan Elementary beginning with the 2015-16 school year. • School Boundary location inquires, telephone or email Facilities at (951) 253-7015. • Intra-District transfer requests, telephone Child Welfare & Attendance at (951) 253-7056. • Bus Transportation inquiries, pleas call the Transportation Dept. at (951) 253-7830. The new boundaries affect eight elementary and four middle schools only. No high school boundaries are affected. No changes were made to boundaries for the following schools: Cottonwood Canyon ES, Earl Warren ES, Elsinore ES, and Tuscany Hills ES. Information letters have been sent to affected student/parent households explaining the new boundaries, asking enrollment intent, and explaining school attendance options. Replies to letters (using the pink or green form enclosed with notification letters) must be returned to a child's existing school by Friday, May 8, 2015.